I am by no means an accomplished knitter. I crocheted on and off, disaffectedly, through college and grad school, but my projects always felt chintzy, and as knitting took over the world and the popularity of knitting groups and circles grew, I felt more and more as though I was pretending at something more important. When I was pregnant with my first son, I had an overwhelming urge to knit–everything! I bought needles, yarn, how-to books, patterns, but couldn’t get it sorted out. How exactly was this supposed to work? I should put the needle where? 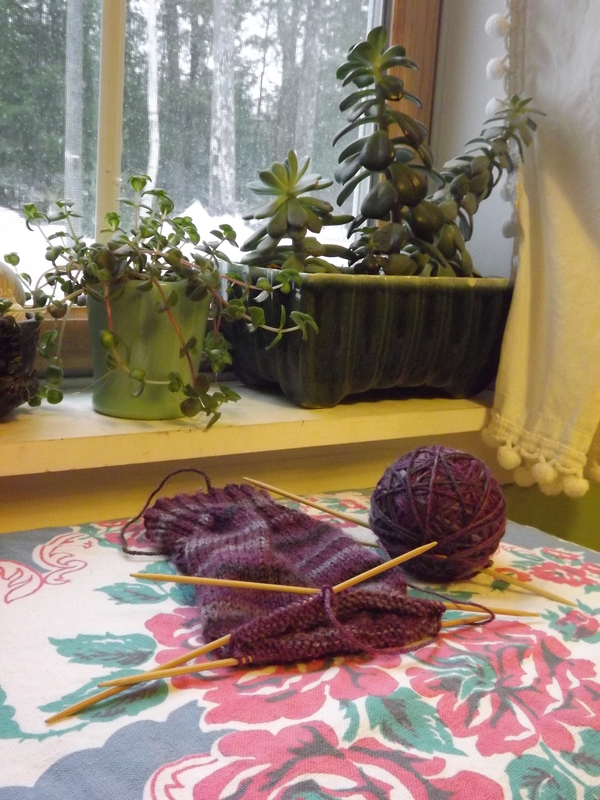 Supplies and all were abandoned until again, while pregnant with boy #2, I needed to knit. These attempts fared no better. I gave up, as I was clearly knitting-impaired. When the small boy was about 6 months old, my friend Rachel of 44 Clovers shop and blog came to visit. With one quick lesson and a little practice, I was off and knitting! I knitted in the car while waiting for the school bus, while watching tv at night, on trips. Oh sweet joy, I could knit! In the 4 years since, my knittiness has waxed and waned. I’ll go through stretches of churning out new projects left and right, and then I’ll leave the needles idle for months, sometimes with a project mid-row. After a long knit-free period, I felt the familiar urge again over Thanksgiving, and I indulged. Socks, my yarn-addled brain whispered. You must knit socks. Now, I know as much about knitting socks as I do about computer programming. Yet, off I went to the nearest JoAnn Fabrics store (we were traveling–my options were limited), and secured two balls of Premier Yarns Deborah Norville Serenity Sock Yarn in Violas (so pretty), which also happened to come with a free sock pattern (win!). I have now knit the first sock down to where I need to create a heel flap and turn the heel, and I must admit, I’m stalled. 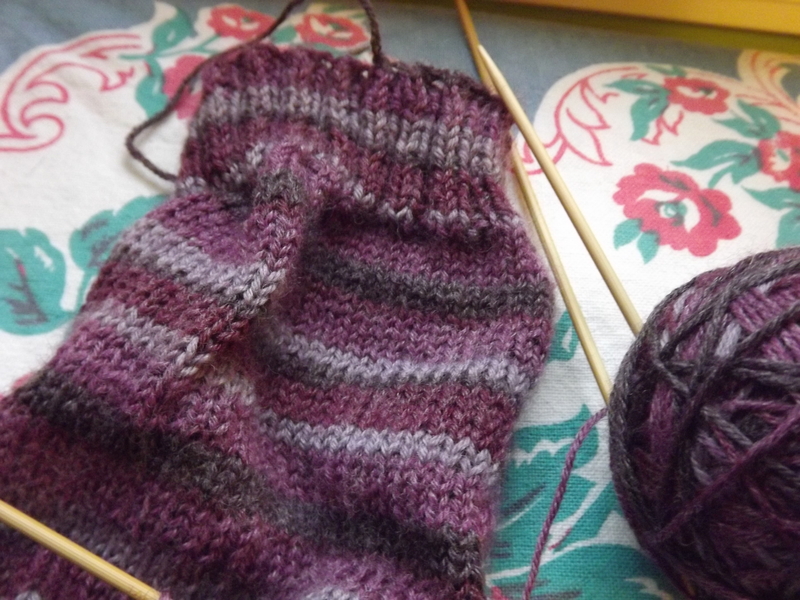 I’ve heard so many scary things about sock-knitting (like computer programming) and most involve heel-stuff. Though this project is a bit stagnant right now, I’ve found the pattern very clear and easy thus far, and the yarn is nice to work with (surprise!). Of course, it wouldn’t be enough to start one project requiring new skills and stretching of my abilities. Nope. That’s why I’ve got two going on now! The same friend Rachel (she’s amazing, no?) 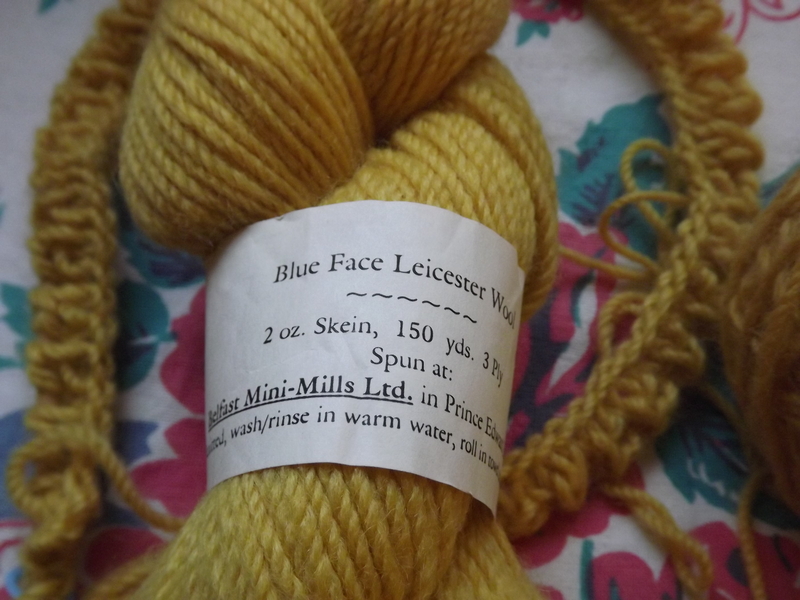 sent me the two loveliest, softest, golden honey-est skeins of Blue Faced Leicester Wool from her trip to PEI’s Belfast Mini-Mills Ltd. late this fall. Oh, this yarn! I could dive into a vat of this yarn and sleep there, happily, for weeks. I hemmed and hawed for a long time about what to knit with this lovely yarn, as surely it needed a spectacular, perfect project. I wanted this yarn to be a blanket, a sweater, a something that would cover all of me forever, but with only 300 yards, I needed to get practical. I have long admired the knitting patterns of Bristol Ivy of Blackbird Turning (also a friend of the amazing Rachel), and when I saw her gorgeous Windrow, I knew I’d found the one. 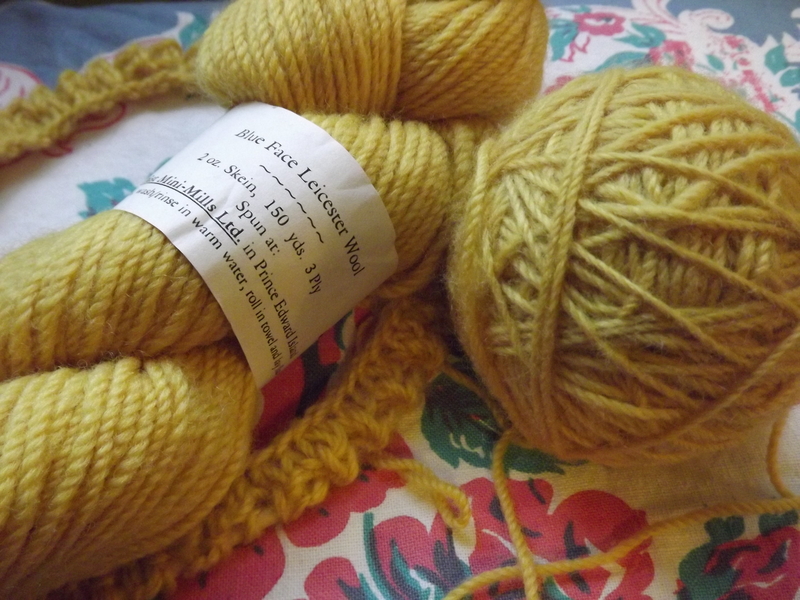 What better for this golden wheat colored yarn than a pattern that evokes “the lines and furrows of a field at harvest”? What better for a farm girl from a farm County? And seriously, did you look at the pictures? Is it not beautiful? I knew that I was in for a challenge, as I’ve never worked with cable needles before (first time for everything, right?). But I gathered the equipment, happily cast on, and ran smack dab into brioche rib. What fresh hell is this? 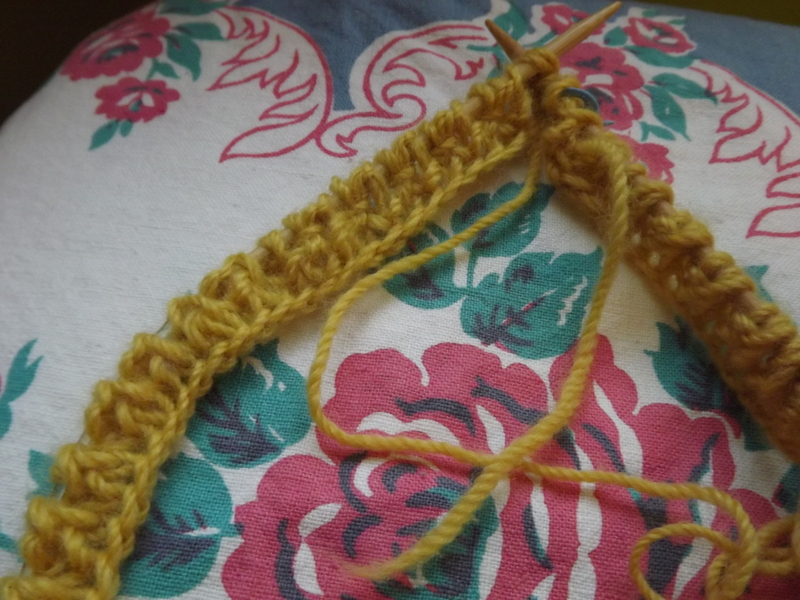 I’ve knit the first 1-4 rows at least 5 times now, and frogged them just about as many. But I’m pressing on, because this yarn. And this pattern. And my vision of their union. I’ll get this, I tell you. Until then, you can find me curled up in the corner of the sofa, cursing brioche and touching the soft yarn. Both of your projects look beautiful! And I’m glad I’m not the only person completely terrified by the heels of socks. My aunt keeps telling me it’s the easiest thing I’ll ever do but I think she’s making it up. My best friend is the same way. She can pull anything up on YouTube and figure out a new stitch in under five minutes where it takes me six months of going back of forth, throwing the needles, having a temper tantrum and THEN realizing it wasn’t that hard. Yes! I actually threw the needles the other night (scaring my husband and pup) and yelled, “I’m not a stupid woman! Why is this so damned hard? !” Heh. Sounds pretty familiar! Except the throwing usually makes my two youngest pups think it’s a game and then they want to play tug of war. Love the yarn 🙂 Trying again today. Yikes! I knitted an Irish knit sweater, and I wouldn’t try socks! Paula, I can’t afford the yarn for a sweater, so I’m stuck with littler projects. I’m excited about the *possibility* of socks. I am definitely fearful of the process.